MODERATOR: We've moved this to a new thread to speed up the forum - trying to keep threads to 100 pages! Yep, well done to Clive and RH for identifying the rock-type, both were way too close for me let on. not exactly a loch.... but lochan nan cat? Scotjamie wrote: not exactly a loch.... but lochan nan cat? No sorry, not there. As I'm going on holiday this evening I should probably make this easier so that it doesn't sit here for a week. The hill on the left is a Munro and the stream is flowing towards a Corbett. The Loch is there somewhere. Well I need to go away on hols now so won't be able to keep this going I'm afraid. The answer was Loch na Fhuar Thuill Mhoir below Sgurr Mor, Ullapool way. ScotJamie you were the closest............... so it's over to you! See ya pals! A benign way of saying I was way off the mark but the only contender! Away on business for the next three days, and wifi signal appalling in this hotel , so can someone else pick up this thread for us, and post a photo please. Shouldn't be too hard: not the actual top of this munro, but not very far from it. Which one..? OK, to get this going, is it Meall nan Tarmachan? With a clue like that - is it An Caisteal? Heh, that would've been a great clue in retrospect but I've never been one for wordplay, sadly. Within 25km of An Casteal. The very flat view stretching off into the distance may be a clue..
Is it the Sassenach's cairn on Beinn Dorain? It's not, and unfortunately I'm also away from tomorrow with limited access, so I'll have to give mine up as well. 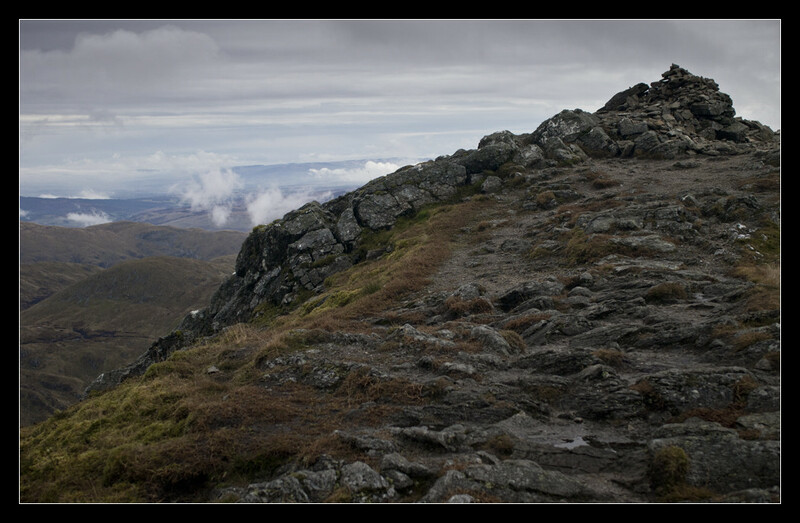 It's the one-metre-or-so lower top of Ben Vorlich (Loch Earn) at the end of the very short ridge from the true summit. Ok, I'll step in. Name the Munro I am standing on. Mancunian wrote: Ok, I'll step in. Name the Munro I am standing on.